Protesters demanding affordable housing march down Milwaukee Avenue in Logan Square on their way to Ald. Joe Moreno's office Tuesday night. 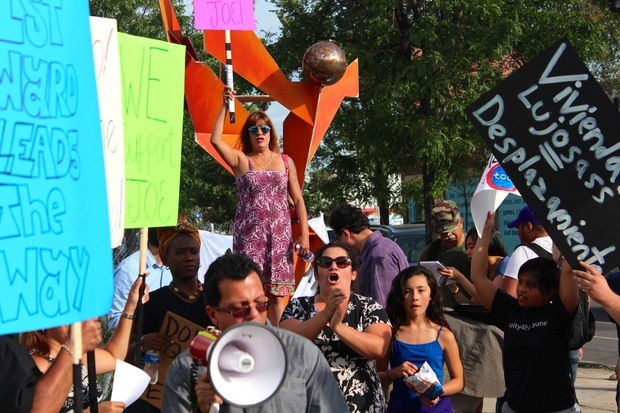 LOGAN SQUARE — A Logan Square organization is calling out Ald. Joe Moreno's backing of large-scale developments in the neighborhood while demanding more affordable housing. 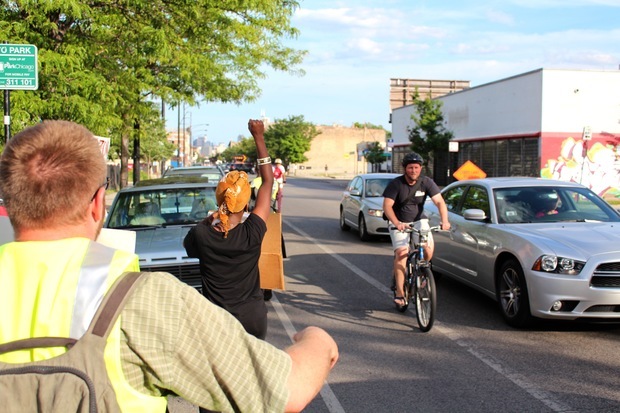 A group of about 50 residents and anti-gentrification protesters gathered at the site of the proposed "Twin Towers" development Tuesday night and marched down the middle of Milwaukee Avenue blocking traffic on their way to the office of Ald. Moreno (1st). The group was met by Moreno supporters who were waiting for them in front of Moreno's office, pro-Moreno signs in hand shouting pro-Moreno chants. The protestors called Moreno a "fake progressive" and claimed he was in the pocket of developers. They asked for an increase in affordable units in developments and a delay in approval of developments to allow for a study and discussion of the merits of transit-oriented-developments. "Something that's called 'T-O-D' has been implemented without any open debate," said 65-year-old Anne Sheetz, who moved to Logan Square in 1986. "It's being rushed." The protestors argue that the developments will raise rents and property taxes in the neighborhood, forcing families to move out. They also argued that the location of the luxury developments near public transit will make it impossible for families to live near public transit. 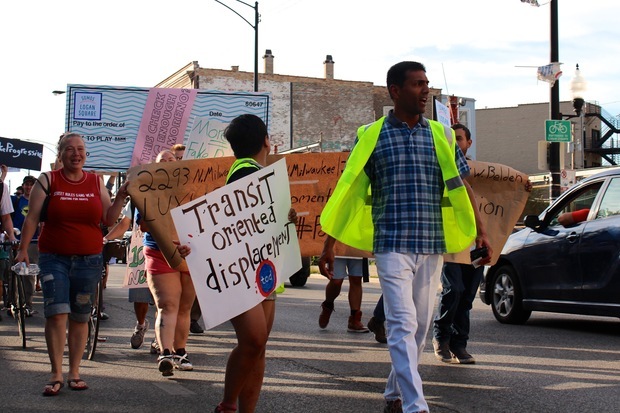 "Today we are here to let Joe Moreno know that what he is doing and the people he is allowing to take over the neighborhood, that is something that we don't want and we don't need," said 27-year-old Logan Square resident Nando Espinosa. Moreno's supporters chanted T-O-D in support of his backing of transit-oriented-development as well as a chant hailing Moreno's backing of the $15 minimum wage hike. When the anti-Moreno group arrived outside the office, 2058 N. Western Ave., they circled around the pro-Moreno crowd with their own chants and signs and at one point attempted to make their way inside. Pro-Moreno backers blocked off the door, using signs as shields and for a moment there was shoving and a quick altercation. Police were on the scene, but did not need to intervene. Moreno was not at the office as he was participating in the National Night Out, a community building campaign police departments host once a year in communities throughout the country. The alderman released a statement in response to the planned march Tuesday afternoon, stating that he has been working hard to increase the number of affordable units in the ward and has helped bring 38 new units of affordable housing into Logan Square and Humboldt Park during his time as alderman. Moreno stated that he has worked with developers to ensure another 88 new affordable units are included in new-construction scheduled for Logan Square and Wicker Park. "I will let my record of action and accomplishment on affordable housing issues stand on its own merits," Moreno said in the statement. "I will continue to work within the confines of what the City Code allows pertaining to affordable housing opportunities in the 1st Ward." Moreno also said he is working with the Logan Square Neighborhood Association and Chicago Housing Initiative to push the Chicago Housing Authorities to spend its massive budgetary surplus. It was not the first time this year the group, We Are/Somos Logan Square, staged a protest against development in the neighborhood. 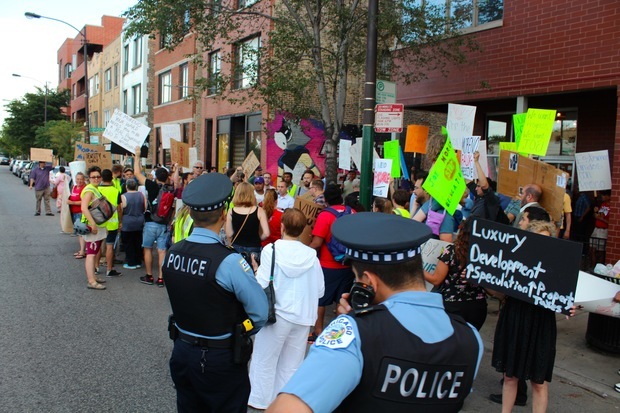 In June the group staged a protest outside the future "L" building, 2211 N. Milwaukee Ave., which broke group in the spring and will include 120 luxury units along with 12 affordable units. There are a handful of major developments planned for a half-mile stretch of Milwaukee between Altgeld Street and Talman Avenue. The projects include a total of more than 600 units. Moreno has received signed commitments from the developers that they must include the required 10 percent of affordable units in each project rather than pay into the city's affordable housing fund in lieu of the affordable units. In April community members presented 900 signatures to Moreno asking him to delay the zoning change on one of the projects at 2293 N. Milwaukee Ave. for a month, but Moreno refused. "What we are saying is that the 10 percent that Moreno is touting as a concession is not enough," said Hafizah Omar, a 28-year-old member of We Are/Somos Logan Square. "The so-called affordable units are not even affordable." Pro-Moreno supporters met the protestors at the interesection of Milwaukee and California.